Book reservations anytime between now and January 4th, and we’ll make your holidays even brighter with a VISA gift card for $100, complimentary valet parking, a $75 gift card for your choice of one of three fine restaurants: High Cotton, SNOB, or the Old Village Post, and a Charleston-themed, handcrafted brass keepsake holiday ornament. You’ll luxuriate in deluxe accommodations, along with evening wine and cheese receptions. Sip a nightcap of Port, or milk with freshly baked cookies, before retiring to a turned-down bed topped with a Charleston treat. Savor an artisan continental breakfast in our elegant lobby, or have it delivered right to your room. Indulge in some gourmet holiday treats along with eggnog, hot chocolate or hot apple cider from our Sweet & Savory Holiday Bar. 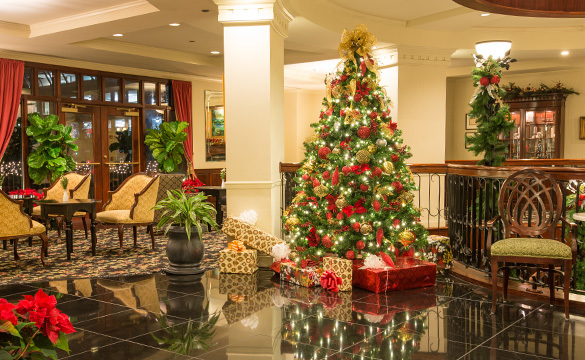 So, make this Christmas your merriest ever, and book now to avoid the last-minute holiday rush! Visit http://fqicharleston.com/packages-and-offers/charleston-packages/ for details.